The Microsoft® SharePoint® 2010 Administration Toolkit contains functionality to help administer and manage Microsoft® SharePoint® Foundation 2010 and Microsoft® SharePoint® Server 2010. New in SharePoint 2010 Administration Toolkit 2.0, the SharePoint Diagnostic Studio 2010 (SPDiag 3.0) provides SharePoint administrators with a unified interface that can be used to gather relevant information from a farm, display the results in a meaningful way, identify performance issues, and share or export the collected data and reports for analysis by Microsoft support personnel. This tool is not supported for SharePoint Foundation 2010. Security Configuration Wizard (SCW) manifests, which add roles for SharePoint 2010 Products to Windows Server 2008 with Service Pack 2 or to Windows Server 2008 R2. SharePoint Workspace 2010 is the new name for and succeeds Microsoft Office Groove 2007. SharePoint Workspace 2010 is a client application that provides fast, any-time interactive access to document libraries and lists on Microsoft SharePoint Server 2010 and Microsoft SharePoint Foundation 2010. 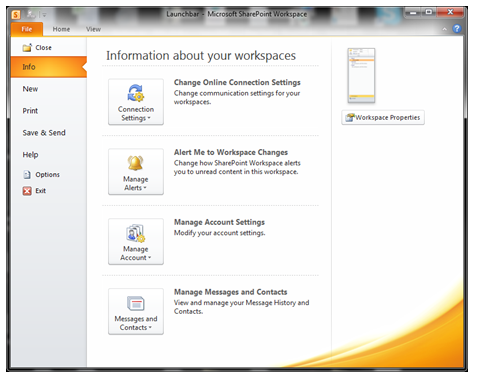 SharePoint Workspace 2010 also provides options for creating Groove peer workspaces and Shared Folder workspaces. SharePoint Workspace 2010 is more versatile than Microsoft Office Groove 2007 and can be integrated with Microsoft SharePoint Server 2010 or can run independently. Microsoft SharePoint Workspace 2010 provides a client for Microsoft SharePoint Server 2010 and Microsoft SharePoint Foundation 2010 that enables real-time synchronization of desktop content with SharePoint documents and lists. SharePoint Workspace 2010 also provides options for creating Groove collaboration workspaces and synchronized shared folders. By using SharePoint Workspace 2010, information workers can easily synchronize online and offline content with a designated SharePoint site or collaborate with external partners and offsite team members through shared workspaces. 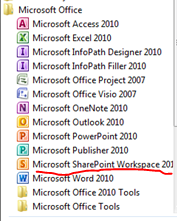 SharePoint Workspace 2010 is included with Microsoft Office Professional Plus 2010. SharePoint workspaces — Provide direct bi-directional synchronization of library and list content between a SharePoint site and a workspace on an individual client computer. Creation of a SharePoint workspace enables individual SharePoint users to check out and check in SharePoint library documents from their local computers, bring SharePoint documents and lists to their computers where they can work online or offline, and synchronize local content with a SharePoint site. 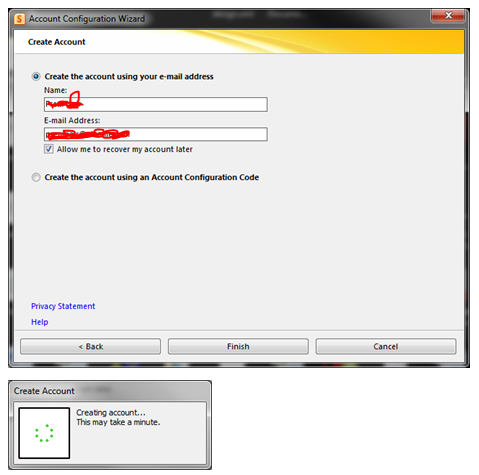 When an individual client establishes a connection with a SharePoint server, synchronization occurs at regular intervals when the client is online. When a client cannot connect to a SharePoint site, the user can easily take work offline to make updates. The updated documents are automatically synchronized with SharePoint document libraries and lists when the user reconnects. This interface offers an efficient and satisfying alternative to browser access of SharePoint. 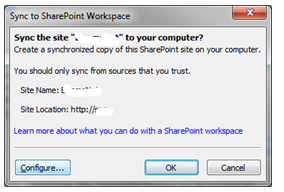 Unlike other workspace types, the SharePoint workspace is a personal synchronized copy of a SharePoint site. Groove workspaces — Provide a rich and secure peer collaboration environment that supports synchronization of content among peer client computers that host a shared workspace. Creation of a Groove workspace enables SharePoint Workspace users to quickly form teams and automatically synchronize online or offline contributions with fellow team members. A full set of collaboration tools lets team members schedule meetings, hold discussions, and share work with trusted partners around the world. Support for communications under various network conditions and across firewalls facilitates timely and effective collaboration. Shared Folder workspaces — Support Windows folder sharing among clients. Creation of a Shared Folder workspace lets information workers share the contents of a common folder in a designated Windows Explorer directory. Easy setup Windows users can easily download and run SharePoint Workspace 2010 without IT assistance. Offline and online collaboration Information workers can easily synchronize online and offline work, through a SharePoint workspace, Groove workspace, or Shared Folder workspace. Content is synchronized dynamically among online collaboration points and updates are transmitted immediately when an offline client comes back online. When an offline client reconnects, SharePoint Workspace automatically adds offline contributions to the workspace and applies workspace updates to the previously offline client. 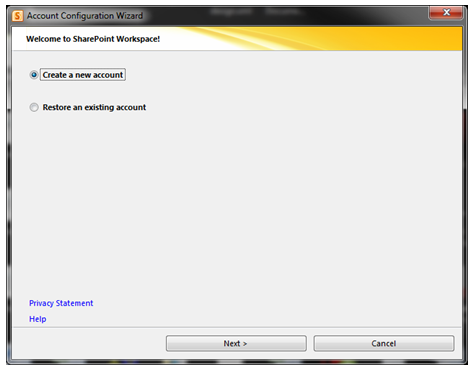 Integration with Windows logon SharePoint Workspace 2010 uses Windows logon credentials to authenticate users so that a separate logon is not necessary. Common file dialog boxes Windows technology enables Microsoft Office 2010 users to directly open and save files in SharePoint Workspace. If you have a SPS domain in your domain network, use your own login credential only. Once the Sync is completed, you can now use your doman SharePoint Site offline and online. SharePoint Workspace operates with a recommeded maximum number of synchronized documents – 10,000. Synchronizing extremely large document libraries, such as a Document Center, is not supported. SharePoint Workspace also has limited support for metadata extensions to the document library. BDC Fields based on Business Connectivity Services – tagging documents based on external datasources – is not supported, and libraries that use BDC field definitions cannot be synced to Workspace. On the other hand, Managed Metadata fields (MMS) can be included in synchronized libraries. SharePoint Workspace is able to view, but not modify, field values based on MMS term stores. To Download SharePoint Workspace 2010: Groove Web Services Software Development Kit, Click here. Anywhere access to business data is now more easily available to Microsoft Dynamics ERP customers, enabled by a new technology spanning Office 2010 and SharePoint 2010 called Business Connectivity Services (BCS). By linking commonly used Microsoft Dynamics ERP information, such as customer or supplier contact details, to BCS, companies can access these details offline in Outlook 2010 or SharePoint Workspace 2010…Microsoft Office, Microsoft SharePoint Server and Microsoft Dynamics now share a common user interface — the Fluent user interface (UI) — that makes them more consistent to use and easier to adopt. Begining of this month, for SQL Server Express users, Microsoft SQL express team has increased the maximum database size in SQL Server 2008 R2 Express from 4GB to 10GB….hurrayyyyyyy. SQL Server 2008 R2 Express with Tools and SQL Server 2008 R2 Express with Advanced Services will allow 10GB databases as well….the database size limit is the only limit they updated in SQL Server 2008 R2 Express. SQL Server 2008 R2 Express is still limited to 1 CPU and 1 GB or RAM. the database size limit in previous versions of SQL Server Express (including SQL Server 2005 Express and SQL Server 2008 Express) stays unchanged at 4GB.. To download the latest SQL Server 2008 R2 Express Click here and select the SQL Server 2008 R2 Express from the Left pannel. Thanks to Todd Klindt’s SharePoint Admin Blog for demonstrating the upgrade procedure to SQL Server 2008 R2 Express. Users who wants to know more about SharePoint 2010…i’ve come across few links which i want to share with you all…!!! and replace ‘&#44’ with ‘,’... and then save the file. This will resolve the error.